The Malinois, a member of the AKC herding group, was originally bred to guard and herd livestock. The breed originated in the late 1800s in Belgium. The Belgian Malinois is one of four different types of Belgian sheepdogs, including the Tervuren, Laekenois, and Groenendael. Of the breeds listed, the Malinois is the most widely recognized. The Belgian Malinois was used for military purposes as far back as World War I with many soldiers bringing their Malinois dogs home to the States after the war ended. It was following that time that the AKC saw a large increase in registrations of this breed. Today, the Malinois is used more as a working breed. These dogs are exceptional at finding explosives, narcotics, and tracking fugitives attempting to avoid apprehension. The Malinois is a protective and highly intelligent dog breed. Having one of the highest energy levels of any dog its size, the Malinois will likely exhibit puppy-like playfulness and energy until at least the age of three. The Malinois is a great family pet as long as early life is focused on socialization and exposure to the young members of the family. The Belgian Malinois is one of the world’s most intelligent dog breeds. That being said, these dogs are also strong-willed, energetic, and have a strong herding instinct. Early and continued lifelong training, and a lot of patience will lead to a well-adapted and loyal family pet or watchdog. The Malinois is a generally healthy canine breed. There are a few things to ask any breeder regarding the health of the bloodline. Some of the concerns to discuss are hip dysplasia, progressive retinal atrophy, and thyroid disease. Through proper screening, these issues can be ruled out in most cases. This dog breed is not suitable for novice owners. Belgian Malinois will shed year round, but a brushing once a week with a firm bristle brush will help control things. Shedding is heavier in the spring and the fall, so grooming twice a week during those times is advisable. Weekly tooth brushing is recommended as well, so get your Malinois used to it early in life. The Belgian Malinois is a herding breed. These dogs are fast, agile, and extremely athletic. They are well-suited for agility, flyball, or herding competitions. The Belgian Malinois should stand between 22 and 26 inches tall and should weigh between 40 and 70 pounds. The Belgian Malinois is a world-renowned military service dog. You can see a great and heart-touching story in the 2015 film Max about a former U.S. Marine Service Dog. 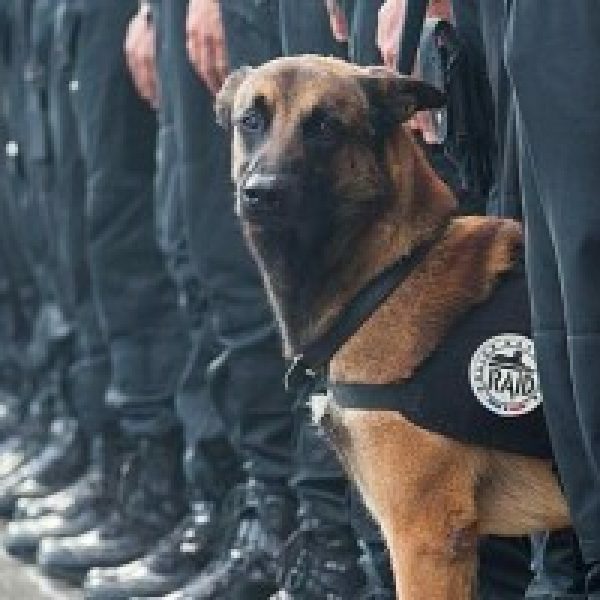 Diesel was a Belgian Shepherd serving on a K-9 Unit with the French Police. He was a hero. His breed and others are common dog breeds employed in K-9 Units.